Set on the lovely Amanzimtoti beachfront, this comfortable South Coast resort overlooks the magnificent Indian Ocean and is ideal for family fun and relaxation. 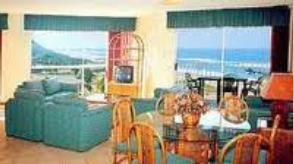 The apartments are spacious, well-appointed, air- conditioned and fully self-catering. Explore the nearby bird sanctuary or take a 25 minute drive to Croc World for an interesting insight into these fascinating creatures, while the sights and sounds of Durban are only 20 minutes up north. The main swimming beach is approximately 1km away where facilities including restaurants, swimming pools, a water park and mini golf. Braai facilities are available in the complex as well. 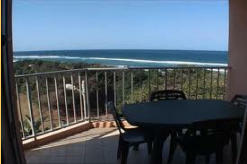 Amanzimtoti is situated to the south of the centre of Durban. It is a popular KwaZulu-Natal or Zulu Kingdom seaside destination for the family and is an important element of the greater Durban Metropolitan area of Ethekwini. Umkomaas, just down the road, is worth an extra mention because 5km offshore lies the internationally renowned scuba-diving combination of Aliwal Shoal and the Nebo - a steamer that sank in 1884. More proof that our beaches have exuded magnetic qualities for a very long time!